The first time I drove a tractor, I was living in Pennsylvania. It was slow, rough riding, difficult to turn and still one of the most fun vehicles I've driven. The first time I rode a fat bike, I was reminded of that tractor driving experience. It was slow, not just in flat out speed, but in handling and steering. That bike was the standard build Surly Necromancer Pugsley. The seat was harsh, the shifters were ancient technology, and the handlebar made it feel like driving a bus with the steering wheel from a 1972 Chevy Camaro after it had been swapped out for a Grant wheel with chain spokes. But on the snow it felt faster, and regardless, it was a ton of fun. The amount of traction it provided gave the impression that you could push it just as hard as you would a regular mountain bike on tacky singletrack. Then I took it down The Rut behind WSU. 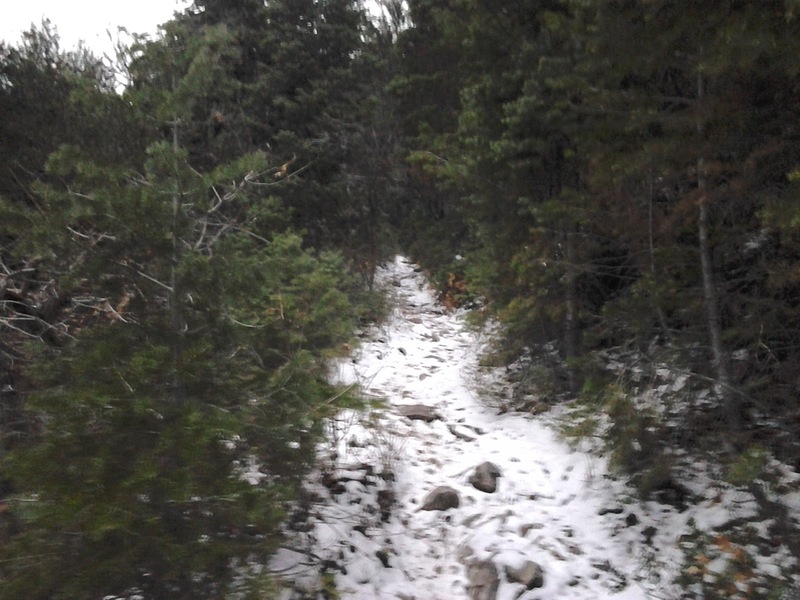 Even with all of its short comings, it was the most fun I had on that trail. This is right as Malan's starts to get rideable. 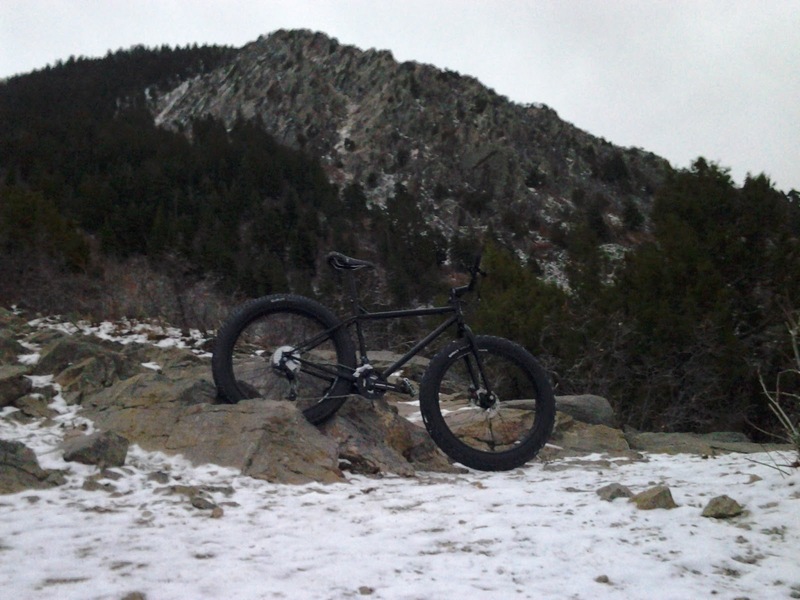 This morning I rode up towards Malan's Peak on a custom build we did. It was still the Pugsley frame with a Moonlander fork, Rolling Darryl rims, Surly Larry front tire, and Surly Ultra New 135 mm front hub, but then we swapped the bars and stem for Truvativ, put a Sram X7 drivetrain on it, changed the rear tire from the Surly Nate to an Endomorph, and upgraded the seat to a WTB Speed V. That helped a lot with all of the shortcomings. It rolls faster, not fast compared to many bikes, but still faster. It handles drastically better because of the bars and the rear tire did make a difference here also. Uphill traction is decreased, but not by any means poor and I didn't notice a decrease in braking traction even coming down the super steep sections on Malan's in the snow. Then I hit the dirt on the way down. I was able to learn so hard into the turns without slipping that I was pedaling extra hard into the turns to see if I could break loose. 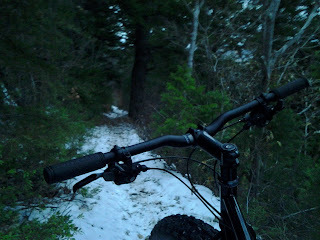 There was something extra fun about boosting off rocks on a rigid steel frame with super fat tires also. The upgrades were noticeable in the snow, but on a different playing field all together from the standard build when in the dirt. I still can't have a fat bike for my only ride, but I can see why some do after my latest experience. 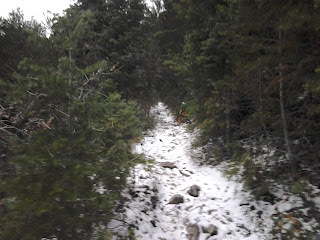 The trail conditions this morning. Lack of traction was never an issue. What a fun experience you have! My favorite thing about cycling is the sense of exploration and adventure that comes with it. Bikes give you access to trails and areas that cars can’t reach. Just like you, I never forget my experience with my Vslope Premium Build . Great read!